I eat a moderate carb paleo and work out(strength) and walk regularly. I am also on a very strict budget of only 40-50 a week. I prioritize good quality meat, mostly organic veggies (at least the "dirty dozen"), and eggs (generally organic and "cage free"), but I am having trouble affording enough quality starch. For some reason where I live sweet potato, my preferred safe starch, is 1.50 a pound, which quickly eats away at my budget. How can I get enough carbs (usually around 75/day) in a more budget-friendly fashion? I thought about rice, but with very little nutrients and such a high GL, I am having trouble convincing myself. Should I get lower quality eggs and buy more sweet potato? Maybe more fruit? Regarding cheap sources of carbs you could opt for Cassava, plantains, sweet potatoes and Yams. But if you are on a cheap budget you could also consume white potatoes or white rice. Check my profile for my youtube channel where I explain about how white rice consumption can be beneficial for people on a Paleo diet! White rice is one of the cheapest carb sources and it is low in nutrients, but also anti-nutrients and is basically just pure glucose/starch. Respectfully disagreeing with raydawg. Potatoes are a great source of nutrition, particularly white potatoes. Here's a pound of white potatoes. That's good numbers across the board for a mere 420 calories. Now toss in some budget foods: eggs, a can of sardines, olive oil, 1 pound of various veggies, and at 1500 calories you've covered nearly all nutritional bases. You've got 500-700 calories to spare to max out your nutrition. You don't even need to eat liver! If you add liver to this diet, you don't really fill in the gaps, you just overload on a few nutrients. Liver is a great "supplemental" food once in a while, but as a daily source of nutrients, it's a waste. I eat a small amount of liver a few times a month and that does have very real consequences for my health. Right-click to open images in a new tab to see larger versions. 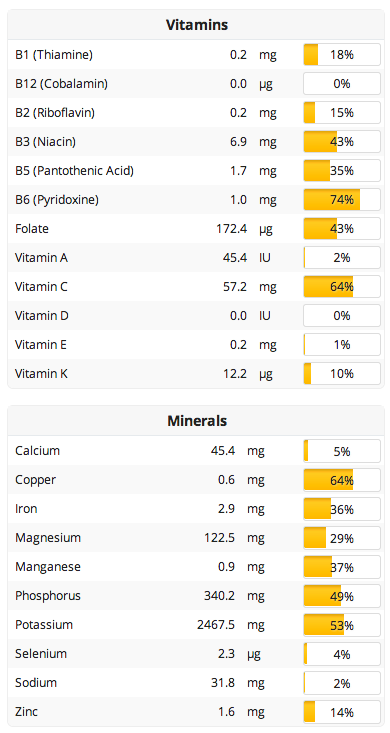 Agree, the nutritional profile of white potatoes vs. sweet potatoes vs. yams is actually pretty close. White potatoes get a bad rap because they're abused in many ways such as french fries, but you can make sweet potatoes un-nutritious the same way by processing them into "sweet potato fries". But eating the entire potato, simply cooked such as roasted or boiled, with some good fats is very nutritious. It can't be a mistake that some entire cultures survived with the white potato as a staple. You can substitute eggs for meat because of the protein, but while sweet potatoes and yams have carbs, they don't have very many nurients. They have relatively more nutrients than white rice or white potato, but they're not that rich when compared to something like liver. I'd shift a few dollars more towards liver, which provides preformed vitamin A unlike the sweet potato, and some to sardines for the fish oil. You can make due with more rice instead of lots of sweet potato. Fruit is overrated. In terms of veggies, if you can get beet roots, those are a powerhouse of nutrition and have great antioxidants and they can double as a carb source. 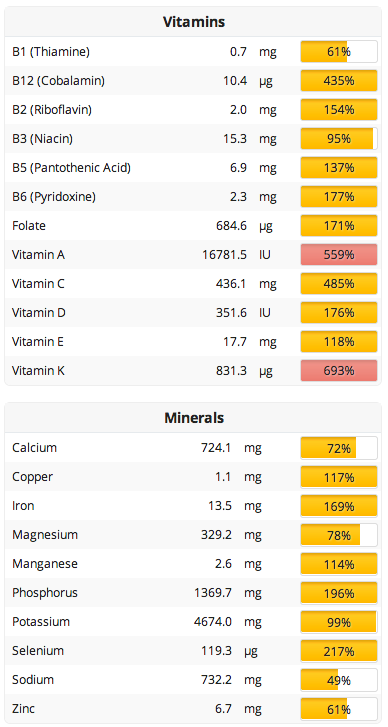 You can use this site to compare food nutrients. You may want to click more on each category as it doesn't open them all at once.